As long as there's been rock 'n roll, there've been musicians who have wanted to transcend the limits of radio and recorded medium to achieve another level of fame on the silver screen. (Thank you, Elvis.) And likewise, many actors have crossed over in the other direction, wanting to leave behind the glitz and glamour of Hollywood to explore the grime and glory of rock stardom (hello, Jared Leto, Billy-Bob Thornton and Keifer Sutherland!) Add to that long list of crossovers one David Duchovny, star of sci-fi drama The X-Files on Fox, not to mention the Showtime series Californication and a long list of minor movie credits. 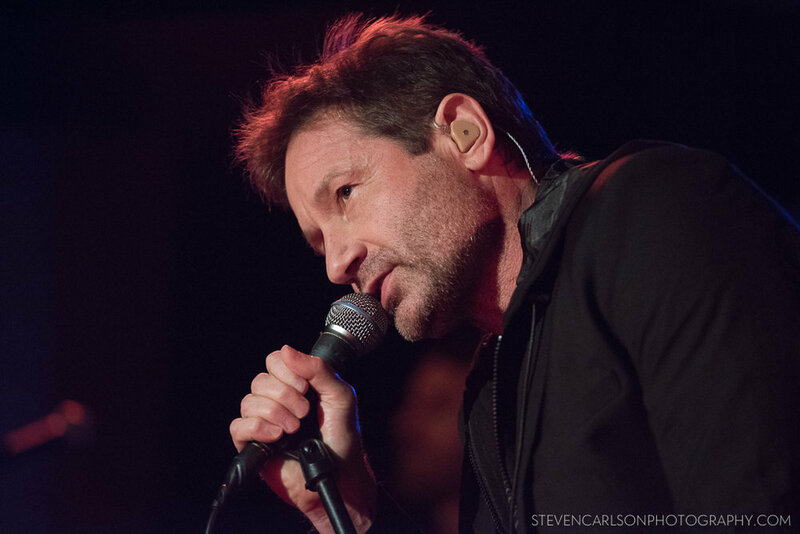 With his acting career in a bit of a lull while talk of an X-Files reboot continued to swirl, David jumped into the music world in 2015 with the release of his debut album Hell or Highwater. It's a bluesy, bar-room style of rock that echoes his New York roots, and while it may not end up on anyone's "best of 2015" lists, it's a respectable first effort for a guy best known for chasing little green men and rambling in a distinct monotone about unimaginable government conspiracies. And recently he's taken his act on the road, playing a string of club dates along the West and East coasts, supported by a young and very capable five-piece backing band. David Duchovny and a crowd barrier that requires a lot of trust. 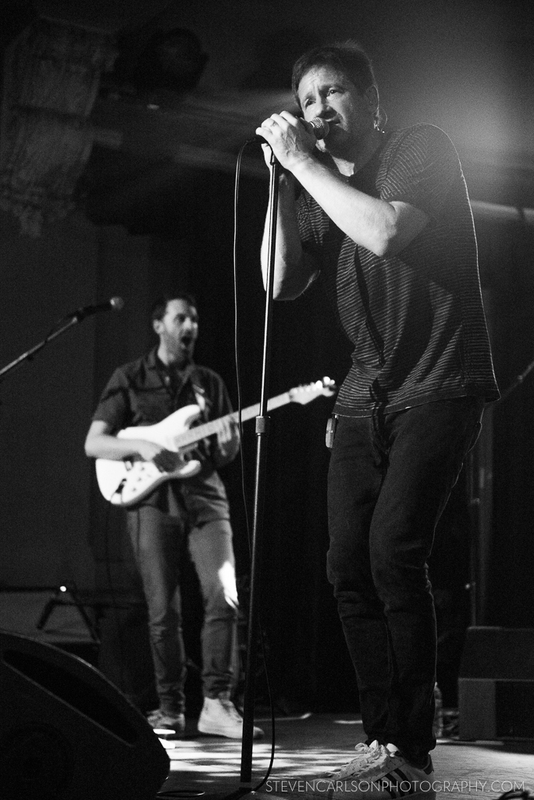 Duchovny's tour made a stop in San Francisco at the Social Hall SF, a relatively new club-sized venue that opened in late 2015 in the basement of the more well-known Regency Ballroom. The Social Hall SF is a gorgeous and cavernous space with multiple rooms and a low ceiling that very much reminds you you're in a basement. Yet it serves its purpose well. The stage is of ample size and very low to the ground (thanks to the low ceiling, I imagine), making photography relatively easy, though a bit awkward when shooting front and center. The lights were quite dim, but nothing worse than what you see in other clubs of a similar size. I was thankful to at least have the benefits of a photo pit in front of the stage, though the crowd barrier was rather flimsy and it inched closer to the stage as the night went on. And I was given the opportunity to shoot the entire show, rather than just the first three as is more common. I live for shows with that kind of photo policy! David Duchovny. I do approve of his sneakers. All in all, it was a lot of fun to watch one of my favorite actors branching out and doing something he clearly loves that isn't what people would expect from him. Writing and producing music, and then getting up and performing it on a stage for customers paying between $28 and $150 to see you (the latter getting you the soundcheck meet-and-greet VIP experience) isn't an easy thing to pull off for even the most seasoned of celebrities, so I give Duchovny a lot of credit for taking his second career as seriously as he seems to be tackling it. He's working on a second album, apparently, which I'll be looking forward to hearing. It'll be fun to see just how much he's growing as a songwriter and performer, and see if he's able to grow his audience beyond those who know him primarily as Fox Mulder.